Today I’m excited to have chapter one from River of Stars by Guy Gavriel Kay to share with you! River of Stars, available on April 2, is set in the same world as the World Fantasy Award nominated novel Under Heaven but takes place about 400 years later. 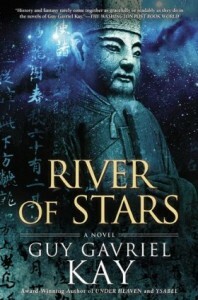 I am currently reading River of Stars, and so far I’m rather enjoying it. I hope you enjoy reading the first chapter! Late autumn, early morning. It is cold, mist rising from the forest floor, sheathing the green bamboo trees in the grove, muffling sounds, hiding the Twelve Peaks to the east. The maple leaves on the way here are red and yellow on the ground, and falling. The temple bells from the edge of town seem distant when they ring, as if from another world. There are tigers in the forests here, but they hunt at night, will not be hungry now, and this is a small grove. The villagers of Shengdu, though they fear them and the older ones make offerings to a tiger god at altars, still go into the woods by day when they need to, for firewood or to hunt, unless a man-eater is known to be about. At such times a primitive terror claims them all, and fields will go untilled, tea plants unharvested, until the beast is killed, which can take a great effort, and sometimes there are deaths. The boy was alone in the bamboo grove on a morning swaddled in fog, a wan, weak hint of sun pushing between leaves: light trying to declare itself, not quite there. He was swinging a bamboo sword he’d made, and he was angry. He’d been unhappy and aggrieved for two weeks now, having reasons entirely sufficient in his own mind, such as his life lying in ruins like a city sacked by barbarians. At the moment, however, because he was inclined towards thinking in certain ways, he was attempting to decide whether anger made him better or worse with the bamboo sword. And would it be different with his bow? The exercise he pursued here, one he’d invented for himself, was a test, training, discipline, not a child’s diversion (he wasn’t a child any more). Due to the length of this excerpt, this is only the first page. To read the rest of the chapter, click here. Guy Gavriel Kay’s work has been described as “elegant, sweeping and colorful” (San Francisco Chronicle), “resonant and powerful” (Washington Post Book World), and “wonderfully imaginative” (Publishers Weekly). A #1 bestseller in Canada and an international award-winning author, Kay has often blurred the lines of genre. Like A.S. Byatt who conceives of fantasy as an alternative to—rather than an escape from—everyday life, Kay uses elements of the fantastic to examine themes of history. RIVER OF STARS is a grand-scale, emotionally compelling work that evokes a magnificent period through vividly realized characters.